It’s 40 degrees... Go jump in a sewage-contaminated river to cool off! Reeling in this soul sucking intense heat here in the nation’s capital, we finally found some comic relief to chill our fried brains when a colleague walked in sweating his privates, complaining of the infamous power cuts that are turning us all into zombies with each passing day. What’s the weather like today, someone asked, making me realise that the Carrot Weather app is now available on Android and we haven’t yet checked it out. Mind you, Carrot Weather is not a new app. In fact, the award-winning iOS app was created back in 2015 by developer Brian Muller, founder of Grailr. Muller created the Carrot AI with a big spoon of snark and sarcasm mixed into its algorithm and Carrot Weather is not the only app to house it. The twisted Carrot AI also resides within a to-do list app, an alarm clock, a fitness tracker app, a calorie counter and more. But, given the weather is currently our primary irritant, we stuck to getting some snarky forecats from Carrot Weather for this dreary month of May. The iOS version of Carrot Weather costs about Rs 400, but since its recent debut on the Google Play Store, it has been a free-to-use Android app for the most part; the fun, insulting parts that is. If you are easily offended, then this app isn’t for you, but for us here at Digit, the free Android version of Carrot Weather has been a much-needed break from the load of mundane weather apps out there. On Android, Carrot Weather is currently in BETA and searching for it on Play Store shows an unreleased version of the app. 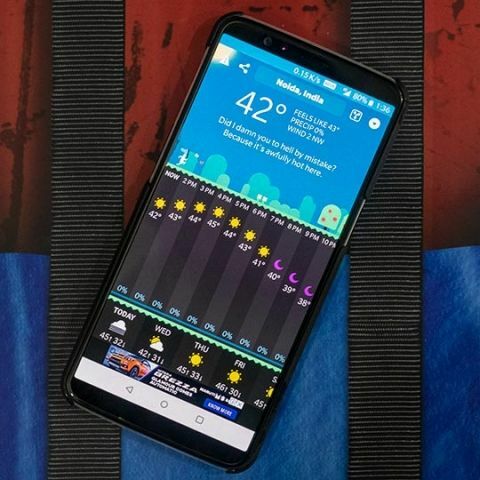 It misses a few cool AR features incorporated in the iOS version, but it still provides weather updates using hyperlocal weather information provider Dark Sky, which is known for its down-to-the-minute accurate forecasts. Opening the app each time wakes up Carrot the AI, who will sometimes cuss at you, call you a meatbag or a dim-witted human being, and then tell you the weather in a truly mean, unexpected way. Just don’t read too much into it and you’ll actually enjoy being mistreated by an AI. The dialogue and scenery in the app changes with the weather conditions, making for a fun, colourful interface. 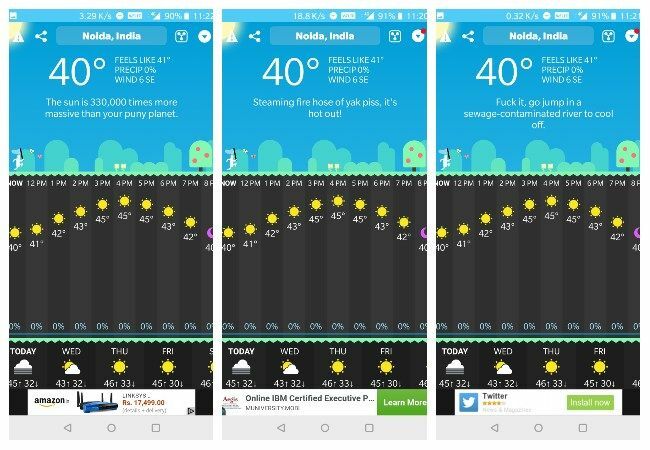 Check out some of the responses we got about the Delhi weather through Carrot. FYI, the weather reading and forecasts matched almost every other local weather app we use. There’s also an interactive map hunt game built into the Carrot Weather Android app which has the sarcastic AI challenge users to find certain spots and landmarks on a map. The experience is entertaining if you are just looking to while away some time. There are also some premium features available if Android users choose to pay Rs 65 a month or Rs 260 per year for the app. 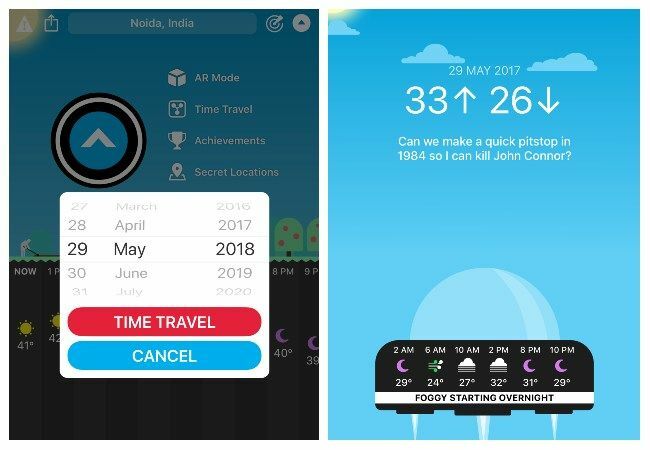 These premium club paid features include - Time Travel, which lets users view the weather for any location up to 70 years in the past or 10 years in the future, and Widget, which gives a users the ability to add a customisable widget to the home screen. Some of the settings of the Carrot Weather app in the Android version are different from that in its iOS counterpart. 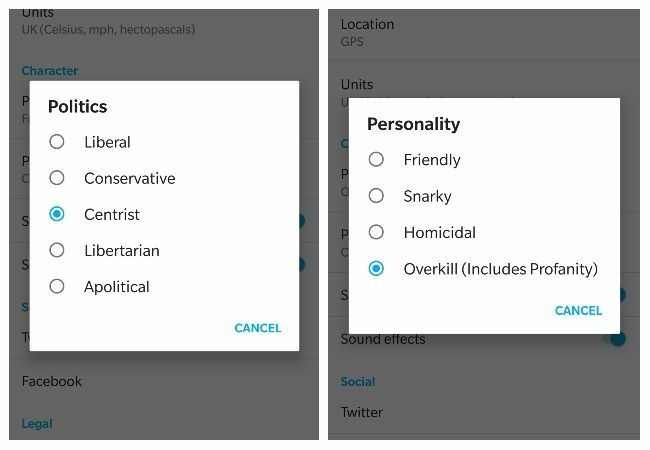 Users can choose between four personality types for the AI - Friendly, Snarky, Homicidal and Overkill. The personality names pretty much describe the nature of responses you will receive from Carrot. While the iOS version of the app also offers the same personalities, it also offers a choice between different voices, which the Android app does not. Both versions of the app allow users to set the politics of the AI - Centrist, Liberal, Conservative, Libertarian. So if you are looking to lighten up your daily weather forecasts and are twisted enough to hear profanities hurled at you by an AI in an app, Carrot Weather is just the pill you need. We prefer the iOS version of the app over its Android counterpart any day, the Android app is currently free (but, with Ads), so go ahead and give it a try...Meatbags!